We’re thrilled to announce that The Dawn will be joining the ‘iCAAD 2019’ conference in London from 6th to 8th May 2019. 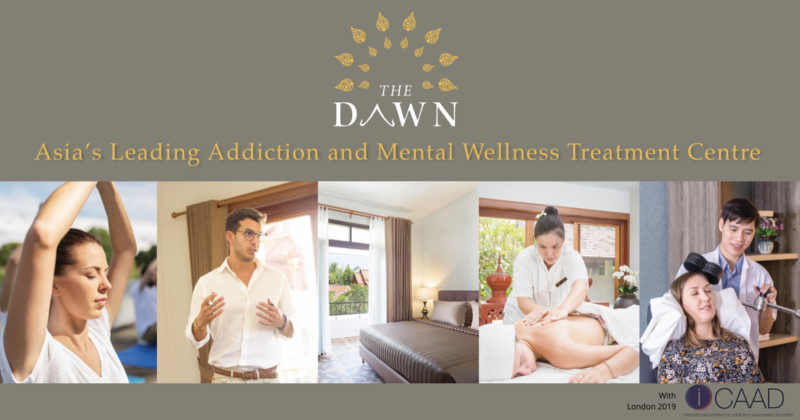 The Dawn’s team will be present at stand 41.
iCAAD is Europe’s leading conference on behavioural, mental and emotional health issues. It is a platform dedicated to expanding knowledge, exchanging ideas, advancing wellbeing and the prevention and treatment of Behavioural, Mental, and Emotional Health issues. The event features workshops, talks and panels, and has developed a platform where these vital conversations can happen. iCAAD London 2019 offers 3 days of networking, strengthening global connection, communication and understanding in the prevention and treatment of Behavioural, Mental and Emotional Health, facilitated by world-renowned speakers on our uniquely eclectic combination of topics. iCAAD 2019’s theme will focus on the realisation of challenging times, both as a collective and at an individual level. It will touch upon the hope and faith that we, as human beings, will be able to adapt to these challenging times with creativity and curiosity. The Dawn will attend for the second year in a row. Our CEO, Ohm Poolsawaddi and our clinical director, David Smallwood, as well as our clinical manager, Tony Tan, will represent The Dawn at this conference. We cordially invite you to visit us at stand number 41 and we hope to see you at the event. Please follow us on our website and social media channels for event updates. Check out the programme itinerary here.